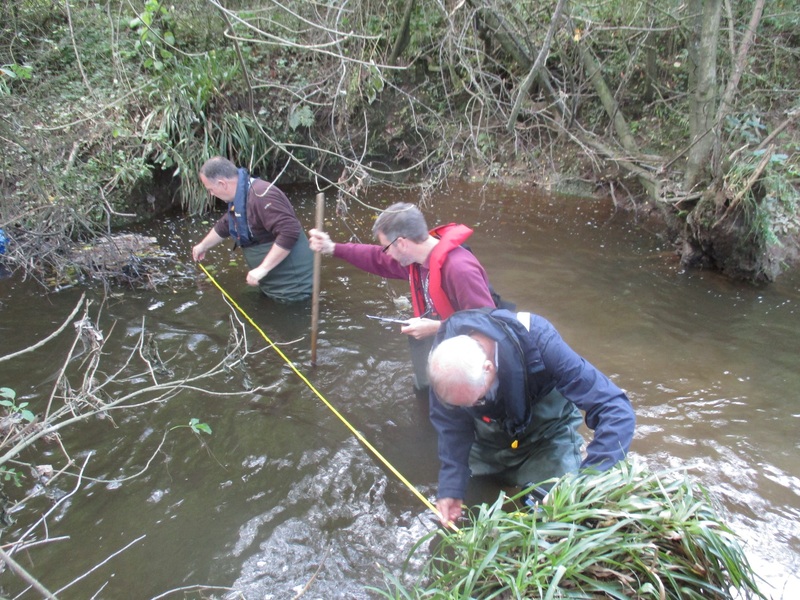 The Freshwater Biological Association has been working with the North York Moors National Park for the last 3 years on the ‘Restoring Freshwater Mussel Rivers in England’ project (funded through Biffa Award). Our role has been to rear juvenile mussels ready for reintroduction back into the River Esk at some appropriate time in the future when the habitat is restored and the water quality improved enough to support them. 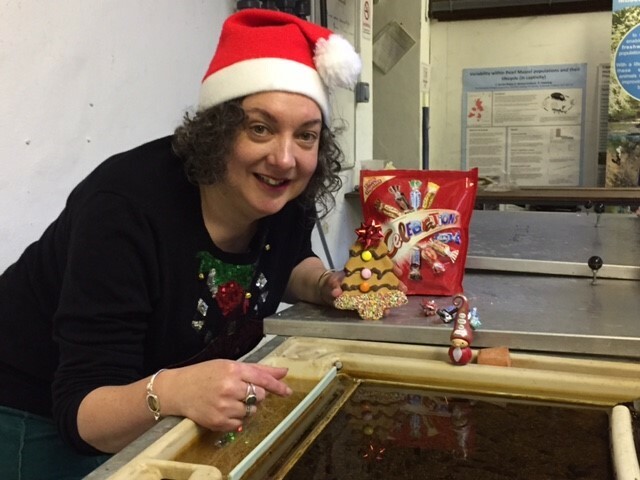 Rearing juvenile freshwater pearl mussels (FPM) is a 24 hrs a day, 365 days of the year operation with our staff attending the hatchery even on Christmas Day to ensure that the mussels, and the host fish that they rely on as part of their lifecycle, are all okay. 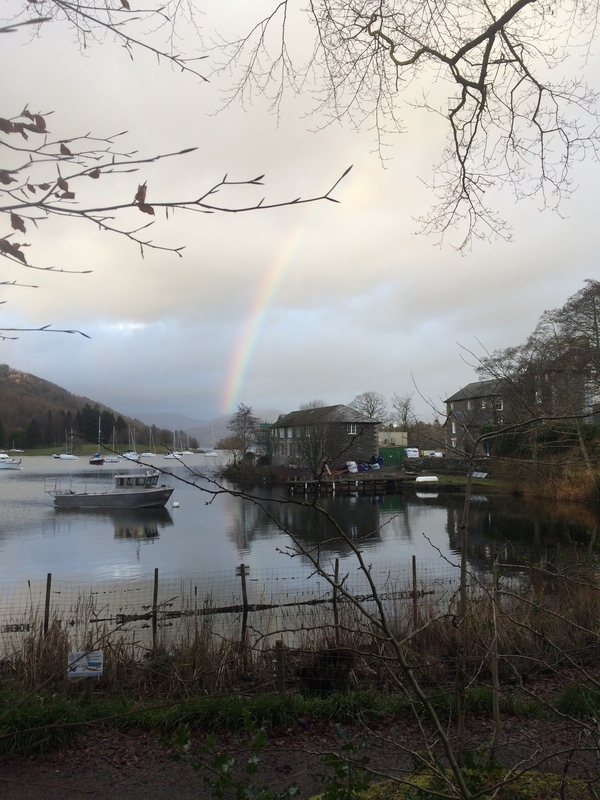 But it’s not a bad job over here on the shores of Windermere. 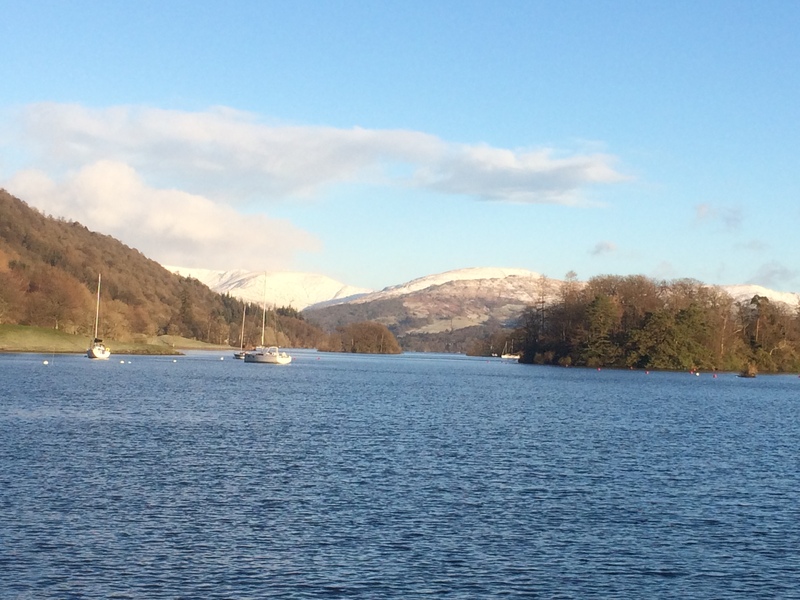 Whilst the wind may funnel up the lake at times, come rain, snow or sunshine, the views are wonderful and we have a great team. The adult mussels are kept in circular tanks in our hatchery connected to tanks which contain host fish. Keeping fish and mussels in close proximity under controlled conditions improves the chances of the mussels successfully completing their lifecycle. We try to maintain the mussels in as natural an environment as possible so they are kept outside in flowing water provided from Windermere. We constantly monitor the mussels and fish to record when glochidia (freshwater pearl mussel larvae) are released from the females and when these glochidia have grown sufficiently on the fish gills. Then we set nets to collect juveniles as they drop off their fish hosts and transfer them to trays in our juvenile rearing facility. Whilst other techniques of bank-side encystment and seeded gravel reintroductions have been used for some rivers we believe that rearing juveniles beyond their most vulnerable pedal feeding stage, when they live amongst the gravels before filtering free-flowing water, will yield better reintroduction survival rates and allows us the opportunity to learn more about these fascinating creatures. Back in 2016, we worked with Simon Hirst (River Esk Project Officer) to translocate more adult mussels from the Esk to the hatchery. This exercise followed a recently commissioned brief from Natural England and was very carefully monitored. It proved successful and we have been collecting the captive bred juveniles in large numbers over the last two seasons. FPM larvae are carried on the gills of specific fish hosts for up to 10 months as part of lifecycle. It is interesting that in recent years the Esk glochidia grow to excystment size (350-400 microns long) and drop of the fish hosts within 2 to 3 months at the hatchery. We are therefore monitoring their survival in the rearing trays carefully. 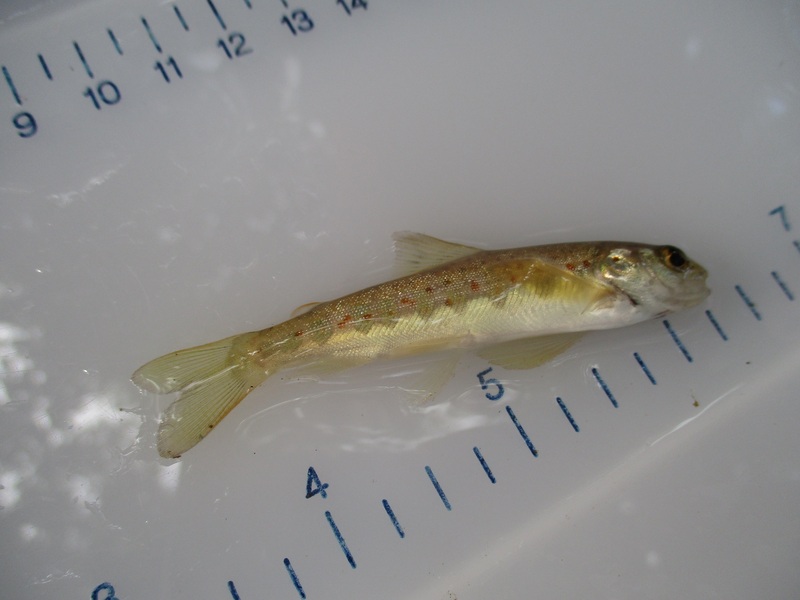 We have been working with other river populations to prepare juveniles for reintroduction into their native rivers. The trays they are reared in are indoors where the juveniles are well protected. So we have set up flume systems to expose captive-bred juvenile mussels to diurnal and seasonal conditions which better reflect the river situation they will be reintroduced to. Once in the flume we can control flow to ‘teach’ them how to adapt to flood and drought conditions. During these experiments we record how many mussels are deeply buried, how many remain on their side on the surface of the gravels and how many are roaming about using their muscular foot. We also record whether they are siphoning water or not. We look forward to the time that we can repeat these experiments for the Esk population but in the meantime have a look at some of our other, older juveniles filmed in their flume – click here. Or organise a group visit and come and see us at the Ark to visit the Esk juveniles and learn more about what we do. This might not be the nicest subject to ever feature on this Blog – but it’s important stuff. The National Park Authority is a partner in the Esk and Coastal Streams Catchment Partnership. All partners have an interest in improving water quality in the catchment. The Catchment Partnership is therefore very happy to be involved in the Call of Nature Yorkshire campaign which aims to reduce inadvertent pollution getting into rivers and the sea when off-mains sewage systems aren’t maintained as they need to be. In rural areas, like the Esk and Coastal Streams catchment, individual homes/farms and small settlements are often not connected to the mains sewage network and so waste – from toilets, sinks, showers, baths, washing machines, dishwashers – is contained in cesspits, or treated in septic tanks or package sewage treatment plants, on site. Cesspits are very basic, these tanks hold waste without any treatment. They need to be emptied regularly and the waste removed. Package treatment works are a bit more technical than septic tanks. An electric pump brings in air which helps bacteria breaks down organic matter more effectively. This means under certain conditions that effluent can be discharged into a watercourse. The Call of Nature Yorkshire campaign is raising awareness of the potential problems if these off-mains systems aren’t maintained properly and providing guidance on maintenance. Local surveys by the Environment Agency have shown elevated levels of phosphates in certain areas of the catchment, and this could be partly due to individual sewage treatment systems and the domestic detergents and human sewage they’re supposed to treat. This isn’t the only issue; diffuse pollution from agriculture e.g. fertiliser, manure and slurry can also cause elevated nutrient levels in watercourses. Phosphate acts as a nutrient and can trigger excessive plant growth in rivers and streams. This depletes the oxygen in the water, smothers the river bed and blocks out the sunlight damaging these important ecosystems. The Glaisdale Beck Restoration Project and the Biffa funded Esk Project is working with farmers to tackle agricultural impacts. But that leaves the accidental domestic waste. General binding rules were introduced in 2015 and apply to people who are not connected to the mains sewage network. All tanks need to be maintained to prevent leakage and to be emptied regularly to prevent over flow, any faults should be fixed immediately and maximum discharge volumes should not be exceeded (without a specific permit). If waste water that hasn’t been adequately treated gets out, it can end up polluting watercourses and beaches so damaging everyone’s environment and the nutrients and sewage released can harm both humans and wildlife. It’s much easier to maintain a off-mains system correctly than replace it when it fails. A poorly maintained system can also have a detrimental effect on the value of the property and so affect a house sale. Dark smelly liquid, sewage fungus (a slimy grey growth), a backing up toilet and a poorly-draining soak away are all indications that there is something wrong. Make sure your system can manage the amount of waste being produced by the household – old tanks were not designed to manage the volumes used now e.g. washing machines, dishwashers. You might need to invest in a new system. If possible space out your use of a washing machine and a dishwasher so the waste water/detergent isn’t entering the system at the same time. Use ‘environmentally friendly’ products – only use small amounts. Don’t flush solid items down the toilet which can block the system and lead to overflow. Don’t pour grease/cooking oil down the sink. Don’t pour paints or solvents or down the drains. If you do have one of these off-mains sewage treatment systems and would like further information please can call the Environment Agency on 03708 506 506. The Call of Nature Yorkshire website also has lots of useful fact sheets with further information. I still recall the morning as, fresh-faced and hopeful, I sat in the back of a bus trundling along country roads towards the North York Moors. As we turned a corner and crested a ridge I was gifted my first view of the National Park and I could feel butterflies in my stomach, this would be my first real job in conservation. This was the start of my life serving the environment as I saw it then (and still do now I suppose). That was about four years ago, things have moved on quite a bit since then. 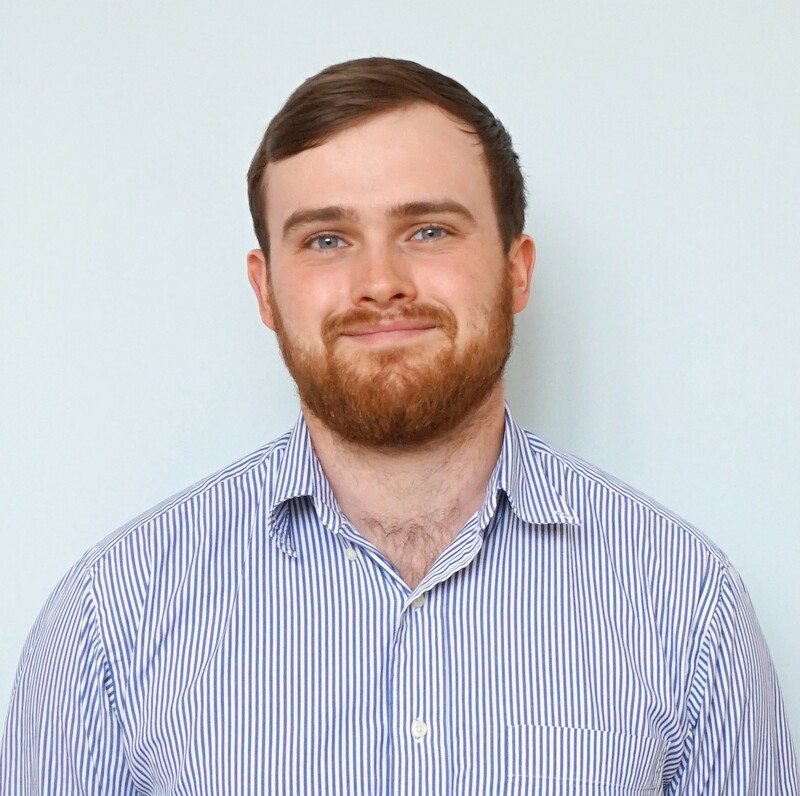 I worked for the National Park Authority on a year in industry placement back in my third year of University assisting with the Esk Pearl Mussel Salmon Recovery Project lead by Simon Hirst aimed at conserving the remaining Freshwater pearl mussel population in the River Esk. It was a wonderful and varied experience. I used aquatic invertebrates as indicators of environmental degradation. 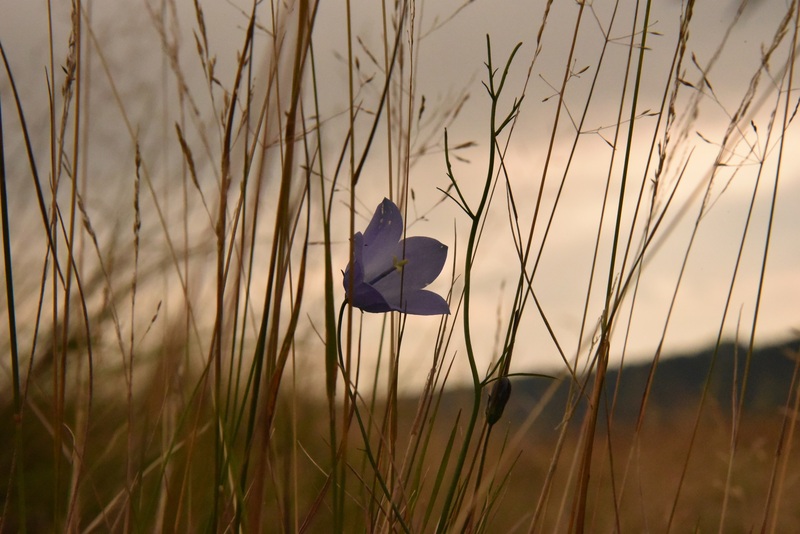 It’s well recognised that moorlands and uplands can have acidification issues, and the North York Moors may well be one of the most extreme areas for it in the UK with its nearby zones of industry. 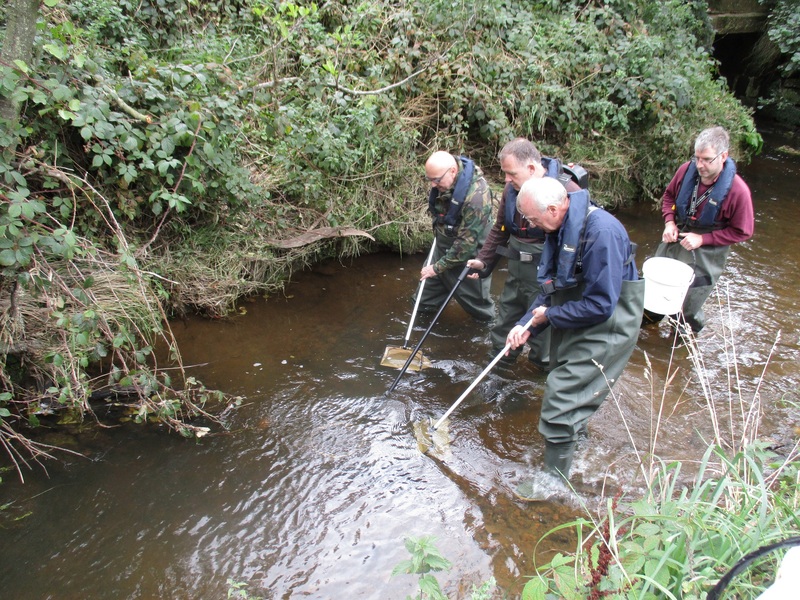 Acid issues have been recorded in local becks in the past, including severe fish kills. However my results were a little surprising. Originally I thought that plantation woodland, being the newer and least natural habitat (compared to moorland which is also man-made habitat), and having less ability to slow down and buffer the incoming water, would have a much more degraded community. However, my results showed significantly more acid sensitive species living in the woodlands than the moorland. This was despite the fact that previous studies had recorded lower pH values (i.e. more acidic) in plantations than in moorlands. I think that the reason for this is the woodlands provide a more diverse and richer freshwater environment for the invertebrates to live in. This is a good sign as it shows that the conifer plantation woodland, that so much of our countryside is dominated by, may not have such a bad effect on aquatic life as once assumed. The aquatic communities were also generally healthier than would have been expected given the severe acidification. I think this shows that the species of invertebrates living in the uplands of the North York Moors are well adapted for highly acid conditions and that, despite the seemingly poor chemical results, life in the upland becks is thriving. What happened next? 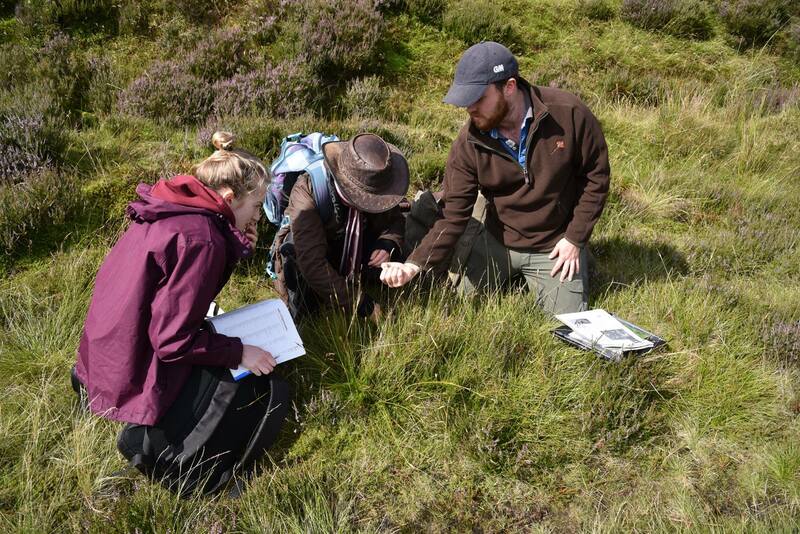 After I graduated from the University of York I went on to work for Natural England, the Environment Agency and now I’m part of an ecological consultancy. I’ve come full circle, and recently I was lucky enough to get accepted for a PhD up in Inverness studying Freshwater pearl mussels. Apparently they needed someone with more waders and bucket experience than lab experience, and I fitted the bill. Scotland is one the great bastions of the Freshwater pearl mussels with populations of tens of thousands in numerous rivers and multiple populations with favourable age structures and reproductive ability (unlike in the Esk sadly). As such, my PhD is to study these populations and monitor them using traditional methods. However the focus of the investigation is to allow comparison of conventional survey methods with new eDNA techniques. Environmental DNA (eDNA) is a method of monitoring species or habitats using the DNA that is freely found in the environment. All organisms living in an environment discard DNA, whether through waste, dead cells, carcasses, etc. and this can be picked up in trace amounts in water, soil, and even air. With Freshwater pearl mussels the hope is that DNA markers and techniques can be designed to allow detection of small or isolated populations of pearl mussels in rivers simply from a scoop of river water downstream of these prospective populations. There is also potential that the techniques could be used to monitor the size, health and population structure of these populations and perhaps even help identify sub species or genetically distinct populations. Whether this is possible or not, the possibility of cheaper and easier monitoring of pearl mussels fundamentally helps with conservation efforts. I’m hoping to be able to keep Simon and the Esk Project up to date with our findings and perhaps provide some new information and techniques that may help the Esk’s own struggling mussels over time. Anyway, that’s my little summary of things. I hope you guys found this interesting. 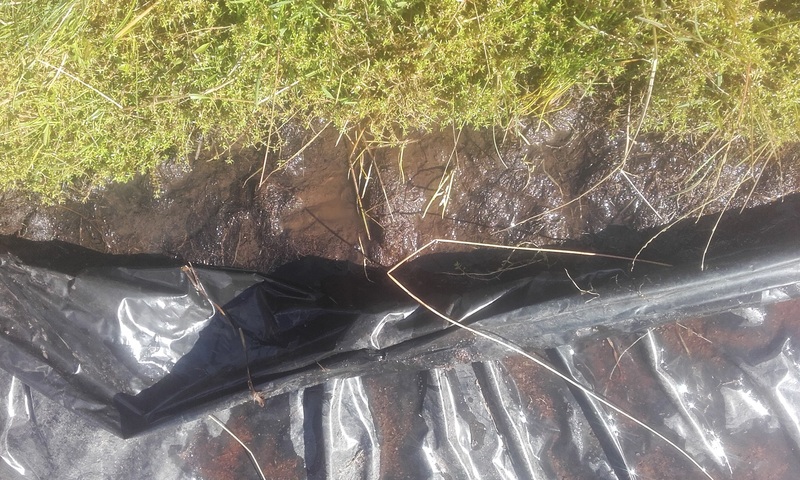 Last September we reported on the installation of black plastic sheeting on a couple of ponds in Bilsdale with the aim of shading out the non-native invasive plant species – New Zealand pigmyweed Crassula helmsii – which was accidentally flourishing there. The idea was to give the plant a taste of its own medicine by depriving it of light. By two months the pigmyweed was becoming etiolated – pale and weakened due to the loss of sunlight – indicting the sheeting was effecting growth. 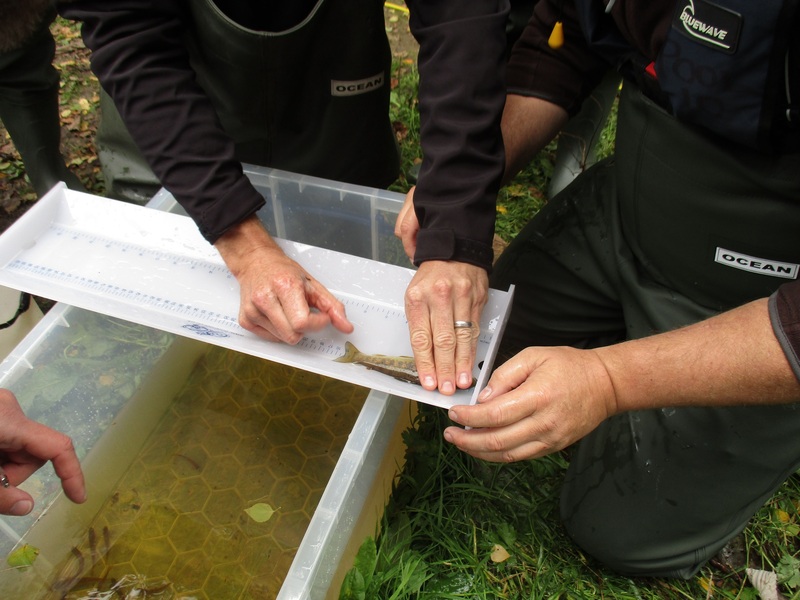 The sheeting was left on the two ponds through the winter and spring, and a second survey was carried out this July. 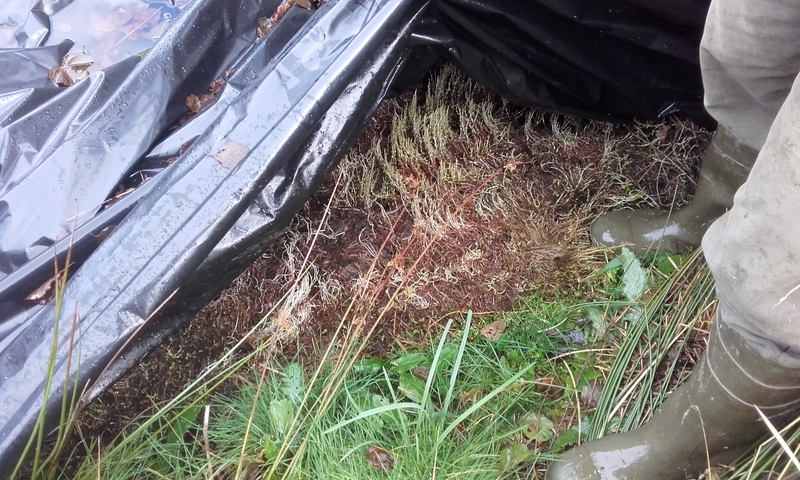 The sheeting has killed off 100% of the pigmyweed that was covered, however pigmyweed plants remain around the edges of the ponds, where it was difficult to install the sheeting due to the surrounding vegetation and irregular shape of the pond edges. The National Park Authority’s southern Apprentice Team will be spraying off the pigmyweed round the edge with a herbicide. 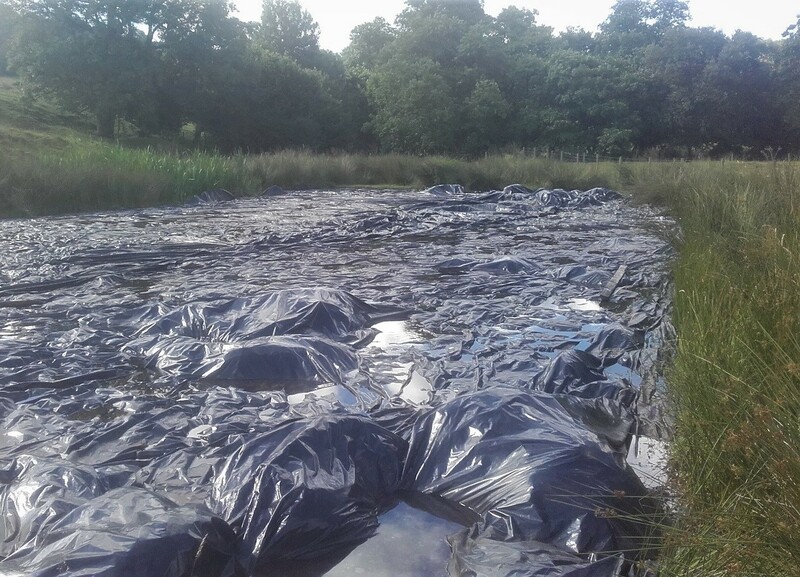 The sheeting will remain on the ponds until at least late autumn to try to finish off this invasive species once and for all in this location, allowing the biodiversity of the ponds to recover. New Zealand pigmyweed is one of the most common non-native invasive plant species found in England, along with Common rhododendron Rhododendron ponticum, Himalayan balsam Impatiens glandulifera, Japanese knotweed Fallopia japonica, and Giant hogweed Heracleum mantegazzianum. They were all introduced into the UK as garden plants. 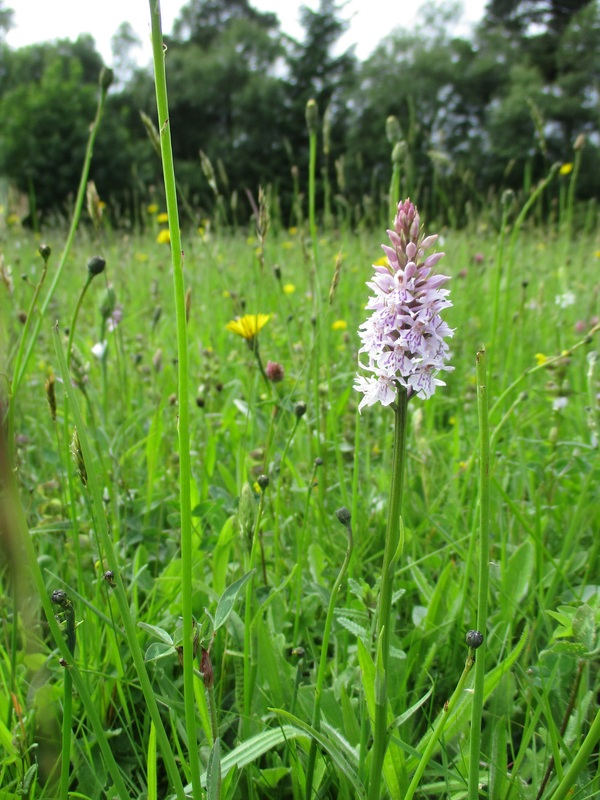 All of these species are present in the North York Moors to some extent, and work continues to control these particular plant species, without natural competition and predators, that can have such a detrimental effect on the area’s habitats and water quality. We’re grant aiding the removal of rhododendron from important Plantation on Ancient Woodland Sties (PAWS), to help let in the light and give native ground flora a better chance of survival. Rhododendron can harbour the Phytopthora ramorum pathogen which is a great threat to forest species such as larch. Himalayan balsam can be pulled out/cut down by hand but this needs to be done before the seeds are setting (August/September) because one shake of a plant can release 1000s of seeds that can travel up to seven metres potentially creating 1000s of new plants. Repeatedly removing the plants from a location before they can seed over a number of years will eventually mean this annual plant no longer regenerates there. Japanese knotweed is trickier to tackle because it needs to be treated by careful herbicide injection. 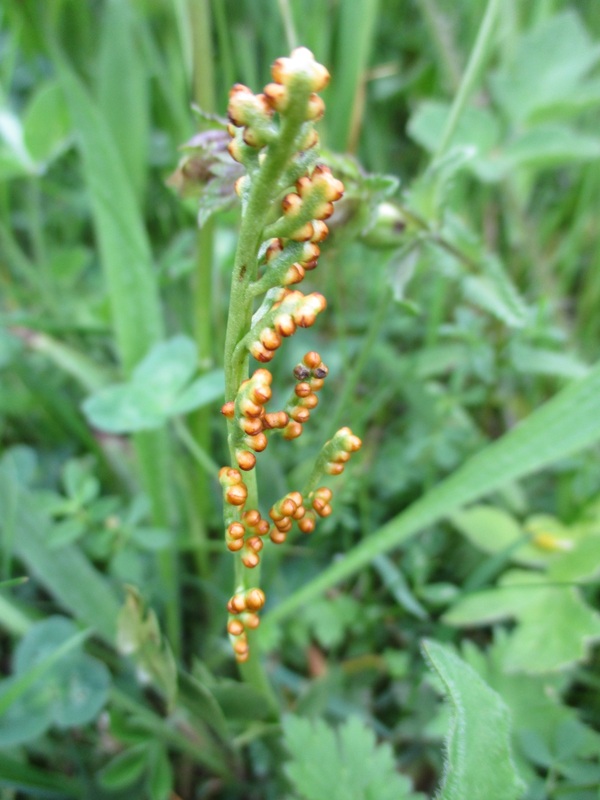 Repeated treatment can kill the rhizome which is so effective at spreading. The accidental breaking up of live rhizomes can spread the plant expediently. Careful disposal is vital. 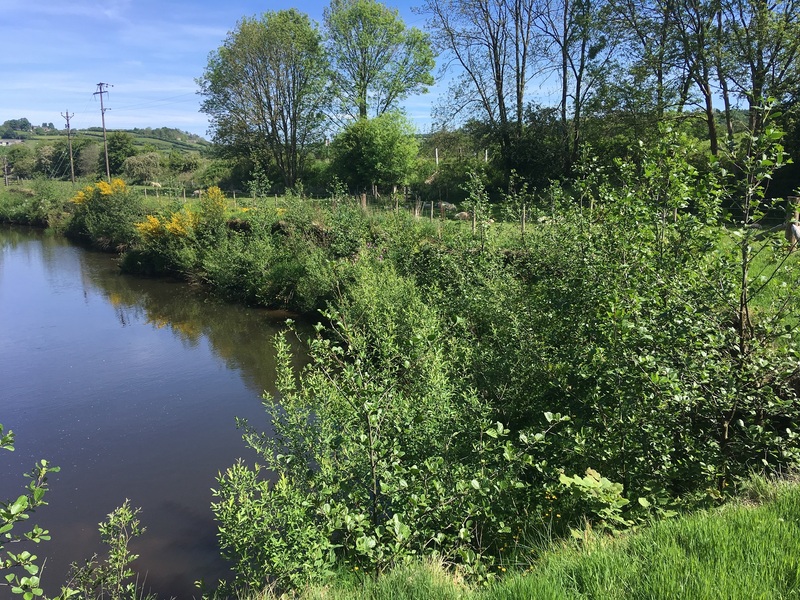 We’re currently making best use of four years of funding from Yorkshire Water to tackle Himalayan balsam and Japanese knotweed along the banks of the Rivers Esk, Rye, Seph and Seven, through whole catchments and sub-catchments starting at the top. 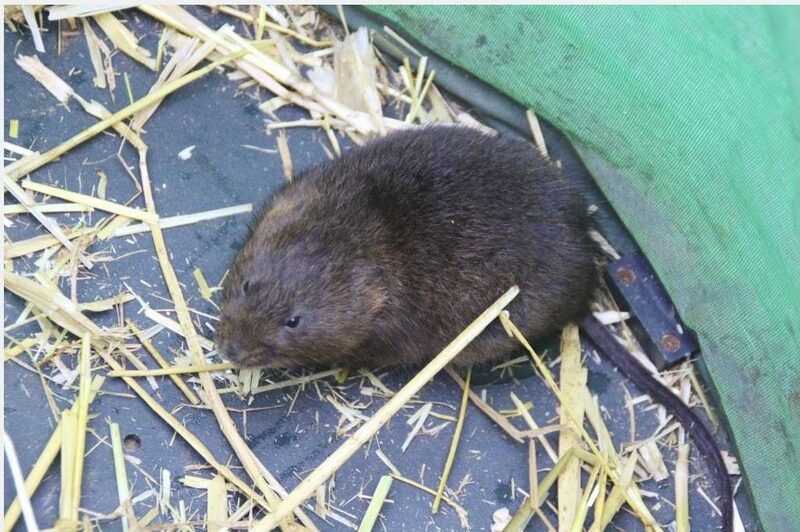 Both species are particularly menacing to river habitats as they out compete evergreen native species and die back in the winter leaving banks bare and prone to erosion increasing the sediment loads in the water. Giant hogweed isn’t quite so common as the other plants in this area. It can be dangerous to deal with because its sap can burn skin so it needs to be treated with care. It can be cut down or tackled with herbicides, but like all non-native invasive species repeat control will be necessary to achieve eradication at a site. There are lots of initiatives now across the country to address the threat of these out of place species, it can sometimes seem overwhelming but concerted repeated local efforts can have an effect. Back in June 2013 the Wild Trout Trust undertook an advisory visit for Glaisdale Angling Club on the River Esk, North Yorkshire. This was an interesting visit, identifying many of the common issues associated with livestock grazing and sandy soils on upland rivers leading to sedimentation. 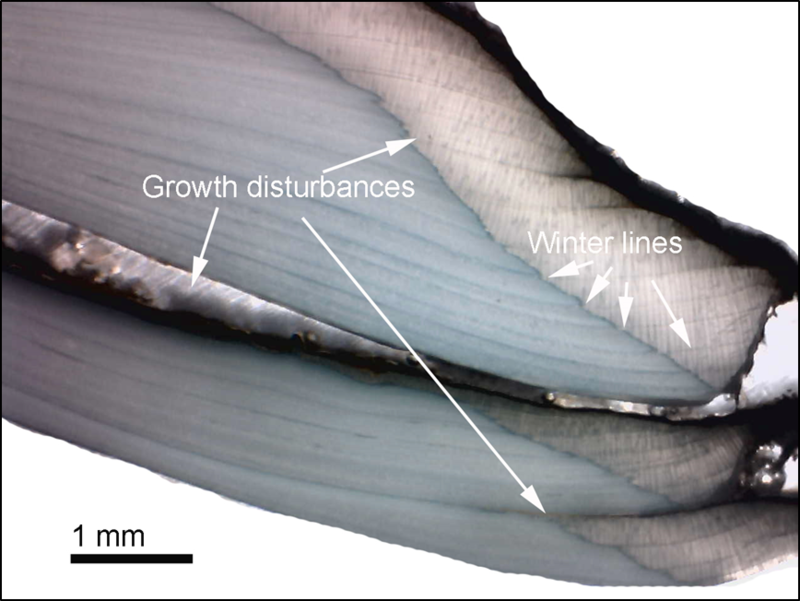 One specific issue was significant erosion on the outside of a particular sharp bend. This is exactly the type of issue that would have once been dealt with by hard engineering, often gabions or rip rap (rock armouring), for which there is already evidence of failed attempts. The Trust’s prescription here was to employ more sympathetic, natural bank protection measures that would actually enhance habitat in the area, rather than degrade it. The use of brash revetment was considered, but the spatey nature of the river meant that there was a potential for further erosion from high water before any protection measures could be completed or take effect. So with this in mind, the recommendation was made to initially use a light touch, low cost approach that focused on fencing off a buffer strip along the bank to control the grazing (one of the main causal factors) and planting native tree species. 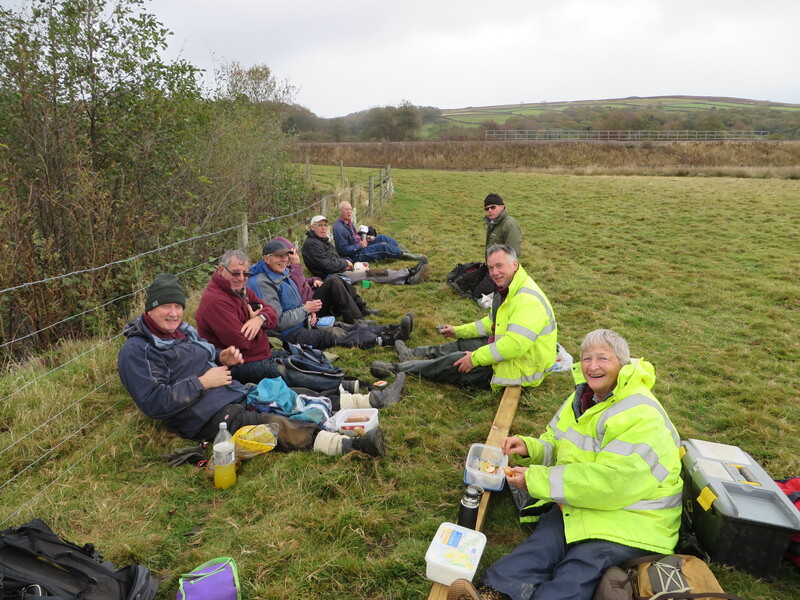 The tree and bank work was undertaken by 10 volunteers from Glaisdale Angling Club, in February 2014, coordinated by Simon Hirst of the North York Moors National Park Authority. In all, over 100 alder, 50 hazel and several hundred willow whips were planted, along with relocation of some of the overhanging bank turves onto bare areas of bank face. As can be seen from the before and after photos from May 2015, fencing livestock away from the river bank has allowed large areas of the bank to become colonised by grass, the foliage and roots of which are already providing significant protection. The saplings and willow whips are now also well-established; the tree roots which will penetrate deeper into the ground and provide additional protection. If the fence is maintained, and livestock continue to be excluded, it can be expected that over the upcoming seasons the more stable bank will facilitate the colonisation of other herbaceous vegetation. This will increase the diversity of root structure within the bank and provide even greater consolidation. The roughness they provide will also aid natural colonisation with local trees and plants by trapping seeds and other propagules (agent of reproduction). Although the bank is still not completely stabilised yet, and the technique is always initially susceptible to failure in very high flows, it is relatively low cost and provides a great demonstration of how removing the livestock grazing pressure can reduce erosion and stabilise river banks. If major floods do not destabilise the banks they will continue to consolidate and stabilise to natural levels. If major floods do cause further erosion in the future, there may be a case for undertaking a more formal brash revetment as well. Kate (Catchment Partnership Officer) and I recently revisited the site with the Glaisdale Angling Club to assess the bank stabilisation work undertaken on this section of the River Esk back in February 2014. Three years later, the young alder, hazel and willow trees are flourishing, and woodrush has also successfully colonised the site naturally. We’re planning to carry out further work in winter 2019, which will involve hazel and willow laying, like you would with a hedge to provide horizontal structure. This work will further protect and stabilise the bank, and some of the stems will also be laid into the channel to provide in-channel cover for fish. I have finally finished my research masters. All that stands between me and the real world is corrections and actually printing a 30,000 (ish) word document. So did I actually achieve anything. Well I’d like to think so, but first up I’ll tell you a bit about what I did, and how I did it. I spent six blissful months walking three beautiful watercourse catchments in the North York Moors – Toad Beck, Danby Beck and Great Fryup Beck which are all tributaries into the River Esk. Aside from sun kissed skin and being chased by sheep, dogs and cows, I somehow managed to collect what I was after – a lot of useful data. To establish the water quality of a river a variety of sampling techniques is required. My favourite was using a probe which measures dissolved oxygen, conductivity, pH, salinity, temperature and much much more. Imagine, dangling a very expensive cable off the side of a bridge and waiting in anticipation for the numbers on the screen to settle. I loved it. Although once or twice the probe did ricochet off rocks to produce an alarming sound. – An anion is a negatively charged ion, a cation is a positively charged ion, and an ion is an electrically charged atom. So what did I actually find out in these three catchments? 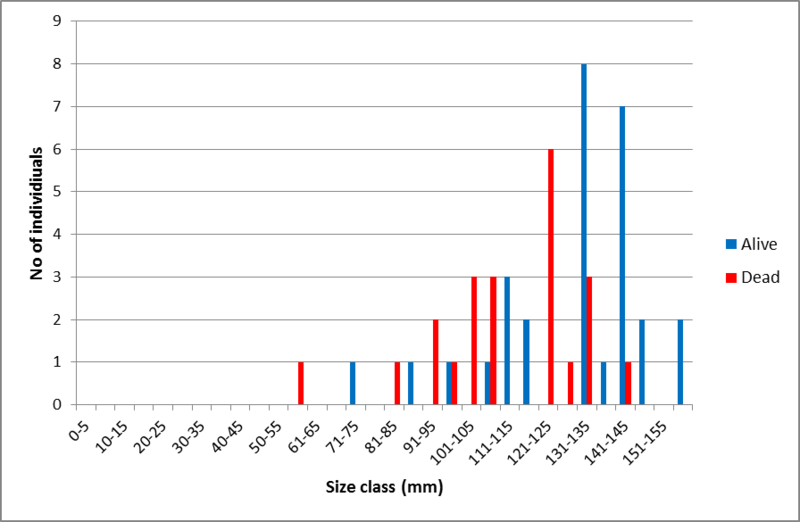 Well I analysed the spatial and temporal variations of a variety of water parameters. The significance of focusing on both spatial and temporal variations within a catchment is it can easily identify areas of point source pollution at a small scale, something which isn’t done often enough. For this post I’m focusing on dissolved oxygen and conductivity. The very important key species Freshwater Pearl Mussels require dissolved oxygen levels between 90 – 110% (Oliver, 2000). Other aquatic life like fish can survive on much lower saturations of dissolved oxygen, as low as <30%. The graph below shows how dissolved oxygen (a vital parameter for ascertaining the health of a river) changes through the year. Changes in water levels and plant growth can have serious effects on the amount of dissolved oxygen available for organic and aquatic life. During the summer months, plants will become abundant in a river, thus using up more oxygen and depleting the overall amount of dissolved oxygen available in a river. Once rainfall increases in the autumn dissolved oxygen levels should be replenished. 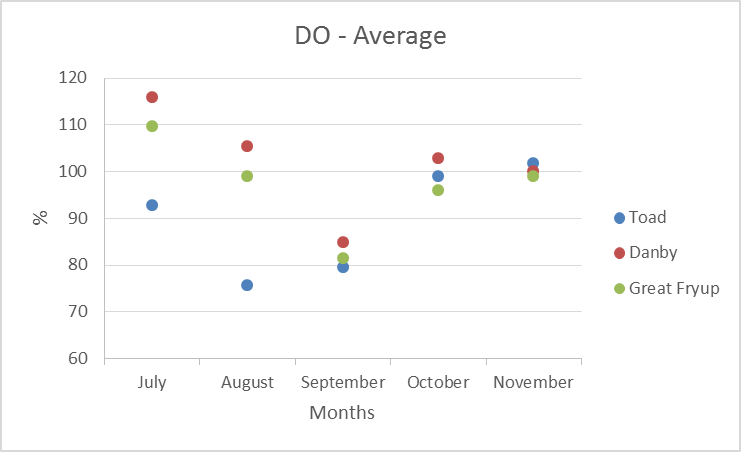 As you can see September 2016 was a particularly poor month for dissolved oxygen, with average levels as low as 80%. Similarly, August on Toad Beck was low as well with an average of 75% saturation. But aside from in September for all three watercourses, and in August for Toad Beck, the dissolved oxygen levels remained within or above the proposed dissolved oxygen threshold. Next up – conductivity. Conductivity is a measure of a watercourse’s ability to conduct electrical flow and is therefore related to the concentration of ions in a river. 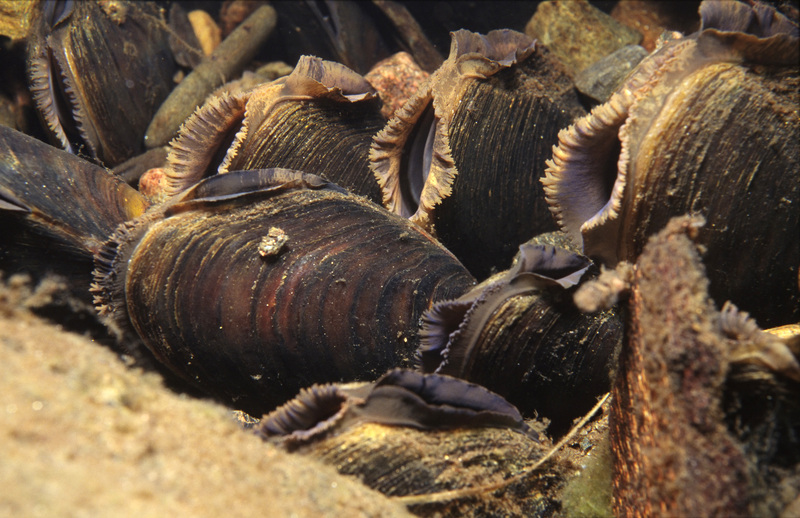 Particular aquatic species need higher or lower conductivity – the Freshwater Pearl Mussel likes a lower conductivity. 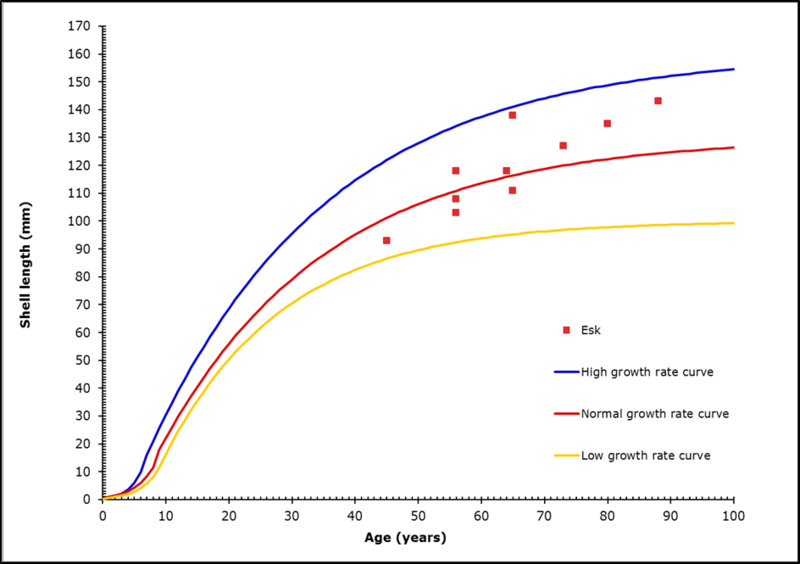 There are variations between suggested thresholds for conductivity: Moorkens (2000) suggests it should be 65µs/cm, whilst Bauer (1988) suggests <70µs/cm and Oliver (2000) suggests <100µs/cm. So I chose the only logical way forward and used all three thresholds. Focusing again on the month of September 2016, I produced the map below. This is where analysing data spatially comes into its element. First up, the circles represent sampling locations (every now and again samples were missed out say if there were a herd of cows approaching as I climbed the style into their field, needless to say my flight or fight response would always be flight as advised in the National Park Authority’s Risk Assessments). Using a traffic light system, green circles represent good conductivity levels. As you can see, September was a poor month for both dissolved oxygen and conductivity. What I found particularly interesting was the variations that could occur in a small watercourse like Danby Beck, where as tributary field drains entered the beck conductivity levels could spike or decrease dramatically; how fantastic! So to round off I thought I’d quickly summarise my thesis’ findings. Water quality is good in the three catchments, but it’s not good enough for Freshwater Pearl Mussels, and that’s the gist of it. 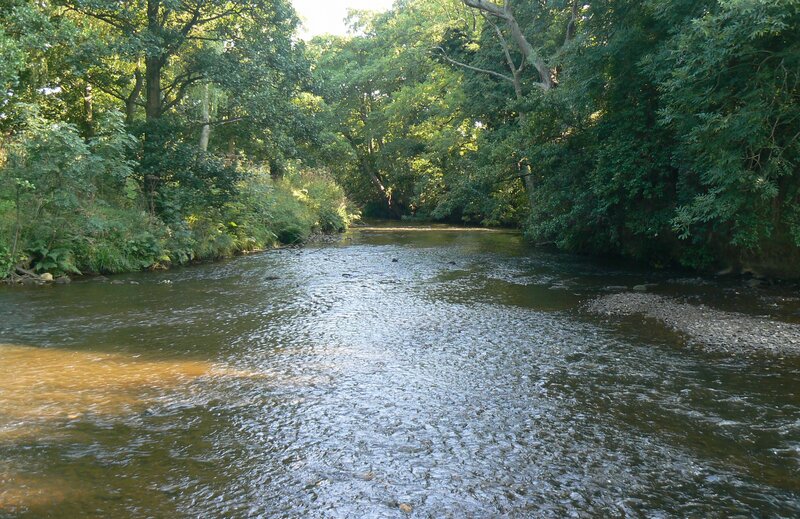 The work of the River Esk catchment officers at the National Park to address the issues is great, the water bodies are reaching and maintaining ‘good’ ecological status, unfortunately the Freshwater Pearl Mussels require pristine water conditions and ‘high’ ecological status. However the future direction is positive for the health and conservation of Freshwater Pearl Mussels. And I too am looking forward to the future; I shall be taking a few weeks off from being chased by animals and I can’t wait*. 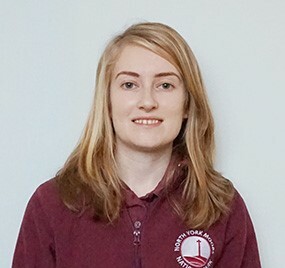 * Editor’s note: Rosie didn’t get much time off – she’s gone off to pastures new and is now a Community (Water Quality) Modelling Project Officer at Thames21. We wish her all the best.